After 38 days, and 58 separate tournaments, the World Series of Poker Main Event kicks off today. Players from around the world make the trip to Las Vegas to enter the biggest poker tournament in the world; a tournament that it’s not until the 7th day of the tournament that the entire field –or what is left of it—is in action on the same day. This year the Main Event will feature four separate starting days, known as flights, and two separate day 2’s, where the remaining players from two of the four starting flights will be combined on each day. 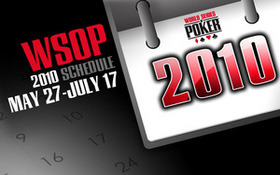 After last year’s debacle which saw players turned away on the final day of registration due to a lack of space, the WSOP has altered registration for the Main Event: Players can now pre-register for a specific starting day, but if the day is full they will have to choose a different starting day. This will also help balance the two Day 2’s which saw a marked difference in the number of players at last year’s Main Event. The big question every year is how many players will enter the tournament? My guess is that the 2010 Main Event will be the second most attended of all-time, with over 7,000 entrants –The 2006 Main Event drew an unprecedented 8,773 hopefuls. So, the wait is finally over; sometime around Noon today the immortal words, “Shuffle up and deal” will be uttered and the 2010 WSOP Main Event will begin. This entry was posted on Monday, July 5th, 2010 at 9:10 am and is filed under Poker News. You can follow any responses to this entry through the RSS 2.0 feed. You can leave a response, or trackback from your own site.